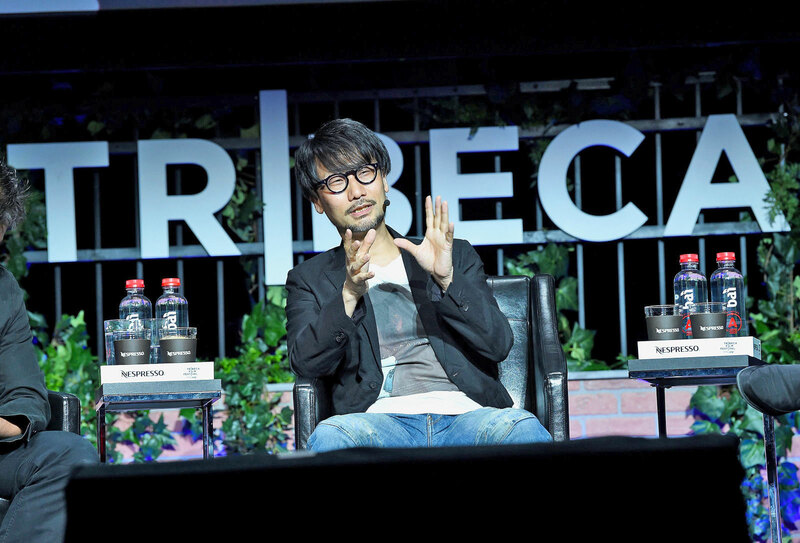 The "Metal Gear Solid" creator went deep at the Tribeca Games Festival. If you're starting a new gaming festival, having Metal Gear Solid creator Hideo Kojima aboard is a good way to prove you mean business. That was the case for the inaugural Tribeca Games Festival, which featured Kojima in a keynote conversation tonight with Geoff Keighley, producer of The Game Awards. The wide-ranging chat covered Kojima's cinematic influences -- of which there were many -- and his progress on Death Stranding, his long-awaited upcoming project. Anyone who's played a Metal Gear Solid game can tell, without a question, that Hideo Kojima loves movies. When he was asked about his earliest impressions of cinema, Kojima says it started when he was a child, when his parents wouldn't let him go to bed without watching a certain amount of movies every night. His first solo theater-going experience for 1975's Rollerball; he was so short, he couldn't see over the ticket counter, and a worried theater attendant led him to a seat personally. Before the age of home video, Kojima would see the same film in the theater several times a day, changing his seat with every screening to get a different angle of the film. And when he finally did get access to video, he would watch Taxi Driver daily before going to school or work. Not surprisingly, Robert De Niro was his favorite actor throughout his teens -- the character of Solid Snake was actually inspired by De Niro's in The Deer Hunter. When Keighley wondered why Kojima liked working with actors in his games so much (Death Stranding features The Walking Dead's Norman Reedus and the great Mads Mikkelsen), he noted that he liked the small bits of inspiration they bring to a project. "By bringing in actors, they do some things that I don't imagine," he said. " That alone makes the world bigger, there's something happening on the stage." Ultimately, that leads to more natural feeling characters than you'd get from completely CG creations. As for progress on Death Stranding, Kojima quipped, "It's moving on PS4... Overall, [we] have the general plan for the project, there's a plot." His team is also still testing out different systems for the game, characters and environment. If the game were an Italian restaurant, he said, he's now focusing on what kinds of tables would be there, and what's actually on the menus. The development progress is "going pretty well" overall, he added. Kojima was particularly intrigued by the possibilities of virtual reality. "A photo has always been something that's been a frame. A painting has always been a frame. 130 years ago Lumier brothers created movies and that was also in a frame," he said. "The media so far has always been about what kind of information you can put inside a frame. This goes the same for games, they're very interactive. In an FPS, you can move around, but it's still about what kind of information you can put inside that frame." "When it comes to VR/AR, you lose that frame. It becomes something totally different. It's about how you can put this information in a completely different canvas... That goes for games and videos. That's something I'm very excited about." Given his excitement for VR on stage, I wouldn't be surprised if he's eyeing some sort of VR project in the future. It's also the ideal medium for Kojima: He helped to mature gaming as a storytelling medium, and I'd bet he has plenty of ideas of how to push that new medium forward. Keighley rounded out the chat by asking if Kojima would ever direct a traditional film. "I love movies, so definitely one day I'd want to," he said, while noting that it would also be impossible until he finishes Death Stranding. Funny enough, he also pointed out that he's worried about making a movie -- since he loves cinema so much, "if I start making a movie I might never finish it." As for what type of movie Kojima would like to make? Not surprisingly, he's game for a "big budget blockbuster." But he's also intrigued in doing a smaller feature with a few characters in a single room. I'm calling it now: #KojimaforDieHard. Check out all of our Tribeca 2017 coverage here.